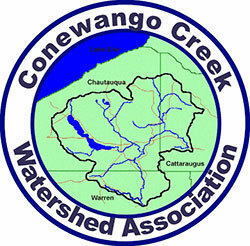 CCWA Mission is to promote the health of Conewango Creek so that landowners, citizens, visitors and municipal officials together take an active role in sustaining the resources of the creek and its watershed. Our main focus is education and hands-on experiences that improve the creek, watershed and re-connect people to the water. For example we have had a great turn out every year for our cleanup. Last year we held our Eighth Annual Conewango Cleanup. Thank you for all your past Support!!! Conewango Creek Watershed Association partnered with Penn Soil Resource Conservation and Development Council for the 2017 PA River of the Year: Allegheny River! CCWA nominated and celebrated Conewango Creek as the 2015 PA River of the Year. In 2018 the CCWA partnered with Dickenson College’s ALLARM program to train 14 local citizens in basic water quality monitoring techniques. The volunteers have been monitoring water quality in Warren County, mostly on Conewango Creek and its tributaries. Monitoring is also occurring on Irvine Run, Stillwater Creek and Brown Run. CCWA will hold this training again in the future. Data is available for viewing on the ALLARM database site. Education is a large part of what CCWA does. We have two private drinking water workshops in the planning for Aug 22, 2019. Also in 2018 we had our Tenth Annual Conewango Creek Cleanup and our Fourth Annual Chautauqua Lake Cleanup. These event are being planned for 2019. We thank all past supporters!! !